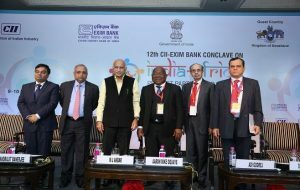 New Delhi: “India and Africa can join together for skill development and knowledge sharing,” said Mr M. J. Akbar, Minister of State for External Affairs, Government of India. 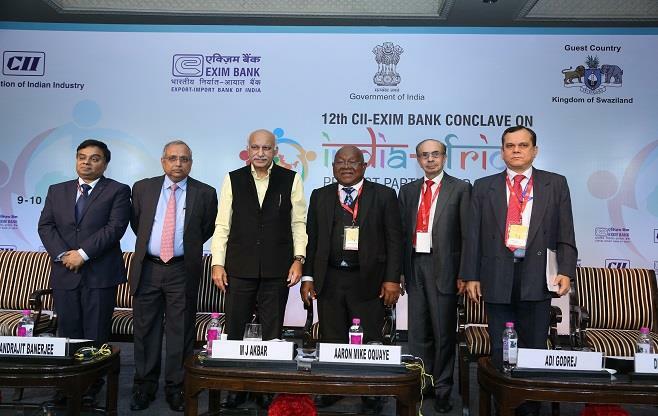 Speaking at the 12th CII-EXIM Bank Conclave on India –Africa Project Partnership, Mr Akbar added that the Indian Prime Minister’s visionary initiatives, such as Jan Dhan Yojana, Digital India, and Make in India can be emulated to address similar issues in Africa. He remarked that open economies are turning to protectionism whereas emerging economies are now the torchbearers of free trade. The basis of India – Africa Partnership in this field should address skill development and knowledge sharing, to contribute to the opportunities and therefore better lives for people. He complimented the efforts undertaken at the tri-annual India – Africa Forum Summit, which in 2015, brought together 54 countries, and concluded with the sanctioning of US$600 million in grants from India to African nations and US$ 50,000 in scholarships. Mr. Aaron Mike Oquaye, Honorable Speaker of Parliament, Republic of Ghana, noted our common colonial heritage and the evolution of a historically close political alliance into a strong economic partnership. The partnership is one of opportunities and benefits for both sides. Encouraging joint ventures could be the road ahead. It would be a fallacy to paint Africa with a common brush. There is a need to acknowledge diversity within the continent. The trade between India and Africa for FY15-16 amounted to US$57 billion with a significant increase in exports and maintained imports. Mr. Manoj Dwivedi, JOint Secretary, Department of Commerce, Ministry of Commerce and Industry, Government of India, noting this, complimented deepening bilateral ties between these two partners. 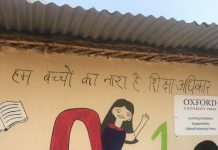 While infrastructure development is important, priority should be given to education, health, and agricultural development. Mr. Adi Godrej, Chairman, CII Africa Committee and Chairman, Godrej Group, highlighted the complementarities between what Africa needs, to develop its growth potential, and the kind of resources and expertise that India can offer. Indian companies will need to enter new markets in Africa so they can continue being global players in the 21st century. Mr. Chandrajit Banerjee, Director – General, the Confederation of Indian Industry, said that 472 projects worth US$ 70 billion were discussed over the duration of the conclave. With offices in Egypt and Johannesburg, South Africa, CII hopes to facilitate more cooperation by expanding its presence in other parts of the continent. With 450 international delegates from 37 countries including 32 ministerial delegations, the conclave was an extraordinary platform exhibiting India – Africa Partnership. The Deputy Managing Director, EXIM Bank of India, Mr. Debashish Malik, extended the vote of thanks to the gathering for making the conclave a successful and great experience.